Live at the Historic Sheridan Opera House! 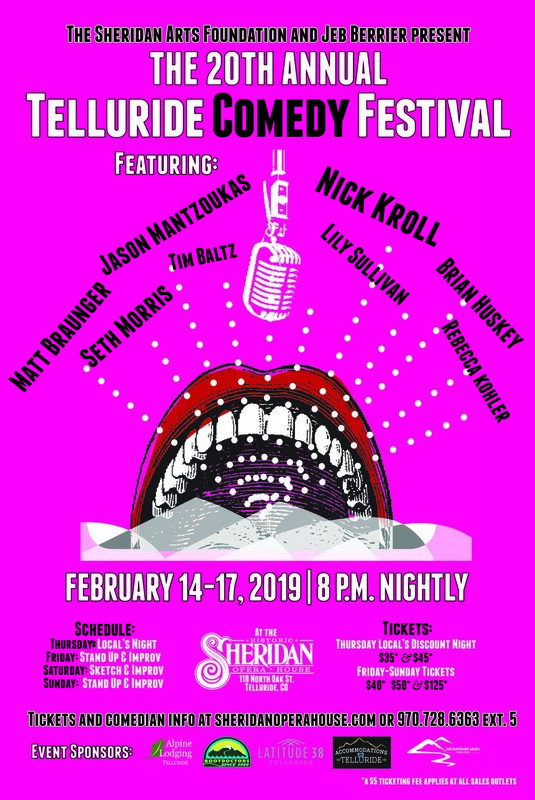 Telluride, CO, Jan. 31, 2019 — The Sheridan Arts Foundation and Jeb Berrier present the 20th annual Telluride Comedy Fest Feb. 14-17, 2019. Don’t miss the President’s Weekend tradition — a hilarious mid-winter weekend of entertainment with some of the funniest and most talented performers in the world of comedy. For 20 years, the Sheridan Arts Foundation has welcomed established stars and new faces to the Sheridan Opera House Stage for a unique mix of stand up, sketch and improv comedy. This year’s festival features some Telluride Comedy Fest stalwarts as well as some new names to the world of comedy. The Sheridan Opera House will open its SHOW Bar for ticket holders one hour before each show. Nick Kroll --- Kroll is the co-creator, writer and producer of the Netflix animated series, BIG MOUTH for which he voices numerous roles, including the lead character. Season 2 premiered on Netflix on October 5th and is 100% fresh on Rotten Tomatoes. Additionally, on behalf of the series, Nick has been nominated for a 2018 Gotham Award for “Breakthrough Series – Long Form.” Kroll recently starred in Chris Weitz’s Operation Finale opposite Oscar Isaac and Ben Kingsley for MGM and Jeff Nichols’ Loving opposite Joel Edgerton and Ruth Negga for Focus Features. Kroll made his Broadway debut with the successful and critically acclaimed show, Oh Hello, On Broadway. The play was filmed and premiered on Netflix in 2017. Kroll’s other film credits include: Uncle Drew opposite NBA star Kyrie Irving, Sausage Party with Seth Rogen and Sing with Reese Witherspoon, Scarlett Johansson and Matthew McConaughey. On television, Nick had his own Comedy Central sketch show, Kroll Show and starred as Ruxin on FX’s The League. Jason Mantzoukas — This marks Jason’s 13th consecutive Telluride Comedy Festival. Credits include: The Long Dumb Road which premiered at Sundance, The House with Amy Poehler and Will Ferrell, Brooklyn 99, The League, Baby Mama, Neighbors, HBO’s Enlightened, The Dictator, Drunk History, Parks and Recreation, Transparent, Children’s Hospital, Kroll Show, The Good Place, Big Mouth, the upcoming John Wick 3 more. Matt Braunger — Braunger has performed his stand-up act on television programs such as the Late Show with David Letterman, The Tonight Show with Conan O'Brien, John Oliver's New York Stand Up Show and Live at Gotham on Comedy Central, as well as his own Comedy Central Presents special. Brian Huskey — Brian Huskey is an actor, writer, producer, and improvisor, performing for more than 20 years of at the UCB Theater. With over 170 film and television credits, Huskey is proudly classified as a “That Guy” known for bringing his excellent comedic and improv skills to whatever role he takes on. As a series regular, Huskey most recently played Richard Schultz, the alien paranoid divorcee’, on the TBS series “People of Earth”. During that time, Huskey also created, wrote and starred in the darkly hilarious specials for Adult Swim, Mr. Neighbor’s House and Mr. Neighbor’s House 2. Best described as a darkly hilarious David Lynch style children’s show, Mr. Neighbor’s House was voted as a New York Times “Best of” for 2016. In 2014, Brian played the lead as well as cowrote with costar and director, Matt Walsh, in “A Better You”, about a self-help hypnotist whose own life is falling apart. He can be seen in such hit films as “Stepbrothers”, “This is the End”, “Neighbors”, “Neighbor’s 2”, “The Disaster Artist” and most recently in Marvel’s “Ant Man and the Wasp”. Huskey lends his talents as a recurring character to see of the most celebrated shows on television. He voices of Regular Sized Rudy, as well as Rudy’s father Sylvester, and numerous other voices on Fox’s “Bob’s Burgers”. On the Adult Swim series, Children’s Hospital he played Chet, the kind but maybe a serial killer EMT worker, and will soon be Chet again in the upcoming Netflix series, “Medical Police”. And most recently Huskey wrapped his seventh season as Leon West, the cruel and snide Washington Post reporter on HBO’s Veep, with his character taking a new position in her campaign team as speech writer. Huskey has also been described as a bald Jason Lee, but Huskey thinks it more like Jason Lee is the grossly hairy Brian Huskey. He lives in Los Angeles with his daughter and four dogs. Seth Morris — Seth Morris is an actor and writer. He's had recurring roles on Veep, Curb Your Enthusiasm, Parks And Rec, The Good Place, and The League. He's also appeared on Modern Family, Broad City and Kroll Show among others. Writing credits include Funny Or Die, Children's Hospital, Kroll Show, the Eric Andre Show and The MTV Movie Awards. Rebecca Kohler— When not writing for CBS’s hit comedy series, Happy Together, Canadian Comedy Award winner, Rebecca Kohler, takes to demolishing stand-up stages in both Canada and the US. Balancing an innate benevolence with a tongue like an acid attack. With fifteen years under her belt, Toronto’s Best Female Comic (NOW Magazine) has had her own half hour special for the Comedy Network, multiple televised appearances at the Montreal Just For Laughs Festival, her own 1-hour show at Toronto’s JFL42, several TV tapings at the Winnipeg Comedy Festival, Halifax Comedy Festival, Moncton Comedy Festival and several other Canadian comedy festivals you may or may not have heard of. Rebecca also tours nationally as a headliner. Rebecca was nominated in 2018 for the Juno Award for best comedy album. It’s like a Canadian Grammy. Rebecca should be famous by now but, whatever. Lily Sullivan — Lily Sullivan is a comedian/ actor/ writer who grew up in Telluride, CO and Chicago. She performed for the Second City and iO Theater in Chicago before moving to LA in 2015. Lily was apart of JFL New Faces Characters showcase in Montreal in 2016. She wrote and starred in her own web series for Project Runway Way called "Project Sammy's Way." Her credits include Comedy Bang Bang!, Jake and Amir's Lonely and Horny, SHRINK, and the upcoming Netflix sketch show "I Think You Should Leave". She also recently made a blurry appearance in the background of a UPS commercial. Tim Baltz — Tim Baltz is an actor and producer, known for Bajillion Dollar Propertie$ (2016), Shrink(2017) and The Second City Project (2015). Hosted by Jeb Berrier — Former Telluride thespian now based in Portland, comedian, former Shakespeare in the Park director and SOH Second Stage Theater director and actor. Locals’ Night! Always one of the highlights of the festival! We pay tribute to the hard-working, and not-so-hard-working, people of Telluride. Jason Mantzoukas and Brian Huskey will lead a mega-talented and hilarious crew with a send up of all things Telluride. Featuring Jason Mantzoukas, Brian Huskey, Seth Morris, Lily Sullivan, Tim Baltz, Rebecca Kohler, and Matt Braunger. Stand up comedy with Matt Braunger and Rebecca Kohler and an improv set from some of the very best in the business. Featuring Jason Mantzoukas, Brian Huskey, Nick Kroll, Lily Sullivan and Tim Baltz. Featuring Nick Kroll, Jason Mantzoukas, Brian Huskey, Matt Braunger, Seth Morris, Lily Sullivan, Tim Baltz and Rebecca Kohler. Whatever happens will be simply amazing and hilarious with the best of the best. Stand up comedy with Nick Kroll, followed by a grand finale long form improv set to end the weekend featuring Nick Kroll, Jason Mantzoukas, Brian Huskey, Seth Morris and Rebecca Kohler. VIP Tables Available In addition to reserved theater seating, eight (8) VIP Tables are available nightly for $500 per table Friday through Sunday. These tables offer prime cabaret seating on the main floor for four (4) individuals plus wine or champagne. Also, if you enjoy being the brunt of a joke or a potential candidate to be brought up on stage, these tables are for you! by phone at 970.728.6363 ext. 5 or at SheridanOperaHouse.com.